A heartbreaking tale of pain, love, and redemption set in New York City Approaching the Speed of Light is a story of tragedy and triumph, fragility and strength. Victoria Lustbader’s brave narrative shines a powerful light on the lasting damage caused by childhood demons that can prevent a life from blossoming, on the relationships needed in order to overcome them, and on one man’s attempt to solve the elusive puzzle of true happiness. Until he was nine years old, when he was adopted into a loving family, Jody was a little boy whose only experience of love was a painful, twisted hell. Now, two decades later, he moves from one woman to another, pointedly avoiding love—the thing he wants most but has never known how to give or take. Jody trusts only his wise and faithful dog Einstein to truly understand him and the darkness that haunts his life even in the bright light of a summer’s day. A chance meeting with Tess, an elderly woman still mourning her long-dead son, sends Jody on a journey back to the tortured memories buried deep below his scars. Tess brings Jody together with Ella Landreth and her shy young son, Evan. These people grow to need one another far more than any of them could have ever imagined. 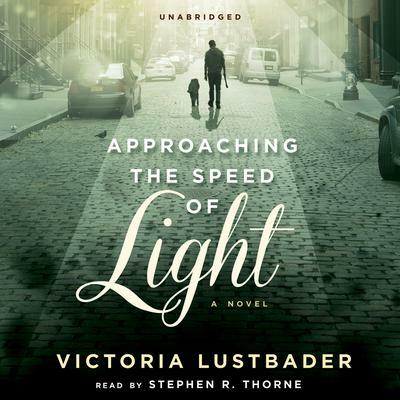 Approaching the Speed of Light is a story of tragedy and triumph, fragility and strength. Victoria Lustbader’s brave narrative shines a powerful light on the lasting damage caused by childhood demons that can prevent a life from blossoming, on the relationships needed in order to overcome them, and on one man’s attempt to solve the elusive puzzle of true happiness. Until he was nine years old, when he was adopted into a loving family, Jody was a little boy whose only experience of love was a painful, twisted hell. Now, two decades later, he moves from one woman to another, pointedly avoiding love—the thing he wants most but has never known how to give or take. Jody trusts only his wise and faithful dog Einstein to truly understand him and the darkness that haunts his life even in the bright light of a summer’s day. A chance meeting with Tess, an elderly woman still mourning her long-dead son, sends Jody on a journey back to the tortured memories buried deep below his scars. Tess brings Jody together with Ella Landreth and her shy young son, Evan. These people grow to need one another far more than any of them could have ever imagined.